It’s probably dated and doesn’t have the colors/styles that you desire. Kitchen Cabinets – Replace or Reface? For years, remodeling your kitchen involved tearing out your old cabinets and replacing with new ones. While it definitely was a value-added enhancement, it disrupted your normal family routine for weeks, if not months, and came with a pretty hefty price tag. Today, there is a choice when it comes to updating the heart of your home—whether it is for resale or to achieve the kitchen of your dreams. Are you satisfied with the current layout of your kitchen? If you answered yes, then cabinet refacing would be the most-effective option for you. Your existing cabinet boxes would remain intact and veneer would be added to them during cabinet refacing. 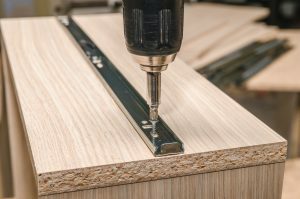 If you are looking to make structural changes that involve the placement of your cabinets, then you would need to consider cabinet replacement. Are your cabinets structurally sound? If your answer is yes, then there is no immediate need to replace your existing cabinets with new ones. Often times, this is the case with older cabinets. With cabinet refacing, your kitchen will appear completely brand new with refinishing or painting the current cabinets or installing new wood or laminate veneer over existing cabinet and drawer fronts. If your kitchen cabinet boxes, doors or drawers are in poor condition or were poorly installed initially, then refacing will not correct the problem. Cabinet replacement is the best long-term solution. How much have you allocated for your kitchen transformation? Your budget will be a major factor in choosing which option is best for you. Depending on the type of refacing desired (and the size of your kitchen), expect to pay anywhere from $1000 to $9,000+ for cabinet refacing. Typically, cabinet replacement will cost twice as much as cabinet refacing. Most homeowners prefer refacing not only because it saves them money, but time, too. Are you looking for a quick, hassle-free kitchen transformation? If you answered yes, cabinet refacing is the right choice for you. We, at Desirable Kitchens and Refacing, are able to complete most refacing projects in 3-5 days or less—without the mess and the hassles of a full kitchen remodel. Additionally, during this time, you are still able to utilize your kitchen. For cabinet replacement, you would need to afford more time and disruption in your kitchen, plus more mess, for removal of existing cabinets and installation of new ones. Ultimately, the time you have and the disruption you can afford will dictate which option is best for you. For some homeowners, the environment may be of more concern than layout, budget or time. If you are looking for the more eco-friendly option for your kitchen transformation, then cabinet refacing is your answer because less items end up in the landfills. Unfortunately, cabinet replacing involves the disposal of complete cabinets—boxes, doors, drawers and hardware. Please feel free to schedule a FREE consultation, and I will absolutely provide the best solution right there with you!